Bowing to Israeli-Saudi desires, the Trump administration is abusing the U.S. intelligence process to whip up a war fever against Iran, much like George W. Bush did on Iraq, reports ex-CIA analyst Paul R. Pillar. The most widely remembered episode of a U.S. administration using an intelligence-based public presentation to stir up hostility toward a country with which it was intent on picking a fight was Secretary of State Colin Powell’s presentation on Iraq to the United Nations Security Council in February 2003. That presentation and the Bush administration’s year-long campaign, of which Powell’s speech was a part, to sell the U.S. invasion of Iraq represented a misuse of intelligence — less because of the substance than because of the whole nature and purpose of the exercise. Instead of using intelligence for its proper purpose of informing policy decisions yet to be made, this campaign was instead a selective and tendentious use of intelligence to sell a decision already made. There was substantive misrepresentation, to be sure. The portion of the speech about terrorist ties was designed to foment a belief about supposed alliances that was contrary to the judgments of the U.S. intelligence community. But even if everything in the speech about weapons of mass destruction has been valid, the speech missed the most important questions about U.S. policy toward Iraq. These questions included what would warrant the launching by the United States of a major war of aggression, and what the ensuing mess and repercussions would be, in Iraq and in the region, after Saddam Hussein was ousted, WMD or no WMD. Now Nikki Haley has provided the closest replication yet of the notorious show-and-tell from 2003. 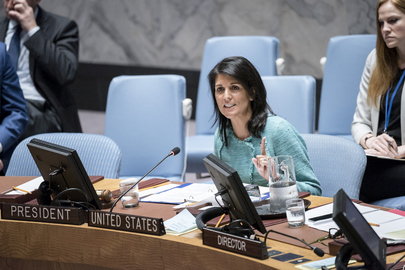 She has tendentiously and selectively brandished pieces, including physical pieces, of intelligence to stir up hostility toward Iran, with which the Trump administration seems intent on picking a fight. The featured piece consisted of remnants of a missile fired from Yemen in the direction of Riyadh, Saudi Arabia.